And we’re running them at four different venues in N19, N1 and NW3. For full details and to book, click here. If you’re a beginner (or an improver) and want to practice off-road to learn to ride a bike, you can do a free basic cycle skills group course. More advanced cyclists wanting to improve their on-road riding can book some individual cycling skills sessions. Take one of our free one-day basic bike maintenance courses and learn how to keep your bike going. To learn how to ride together as a family, you can book family cycle skills sessions. Explore the borough on our Islington By Bike rides. There are two rides a day on Friday 22, Friday 29 July and Friday 5 August. Each day two rides set out at 10am, one from Rosemary Gardens and the other from Elthorne Park. There’s a rest stop halfway and we will get you back by noon. 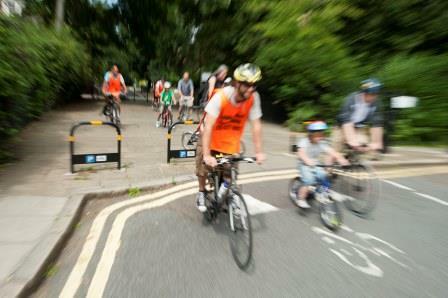 These family-friendly rides are run by Islington Council and led by qualified instructors. Free of charge, but places are limited, so book in advance here. There are many more free guided rides in London. Why not take part in a Sky Ride? Sign up at www.goskyride.com. You can also arrange your own rides via British Cycling’s Ride Social website. And why not grab the chance to cycle on traffic-free roads in central London at the RideLondon Freecycle on Saturday 30 July. It’s free to take part, but you need to register. 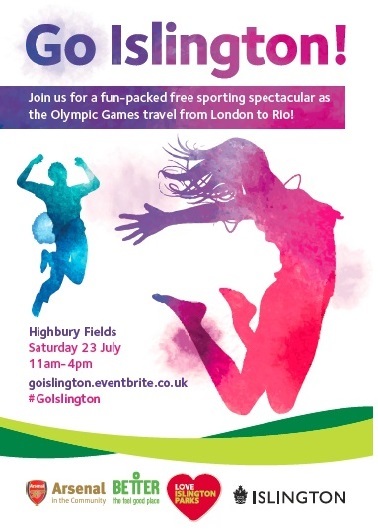 There are more sports and activities on offer than you can shake a hockey stick at on 23 July at Go Islington! Aside from a Dr Bike and all ability cycling, there will be a chance to try out many Olympic sports such as running, tennis, handball, football and basketball, Full details here. Explore the borough on our Islington By Bike rides! There are two rides on Friday 3 June setting out at 10am from Rosemary Gardens and Elthorne Park. There’s a rest stop halfway and we will get you back by noon. 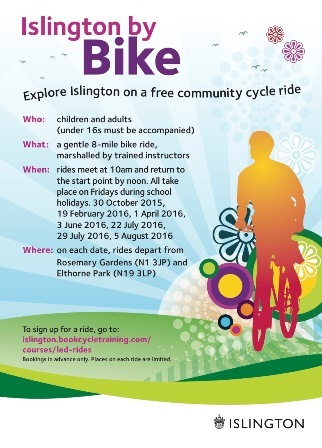 These family-friendly rides are run by Islington Council and led by qualified instructors. Free of charge, but places are limited, so book in advance here. Save the date for a cycling party! 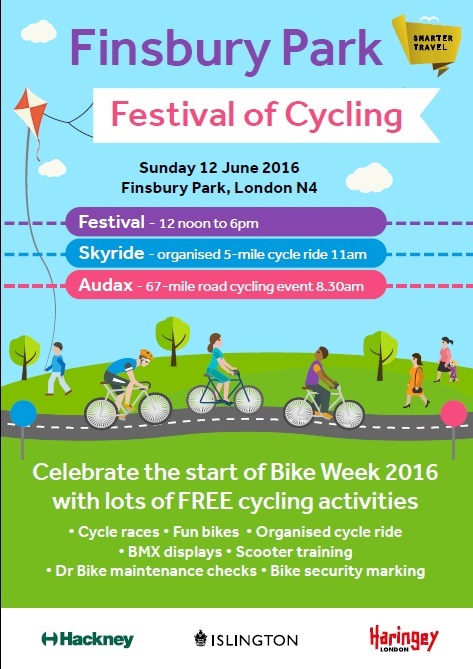 Come and celebrate Bike Week on the 12 June at the Finsbury Park Festival of Cycling. 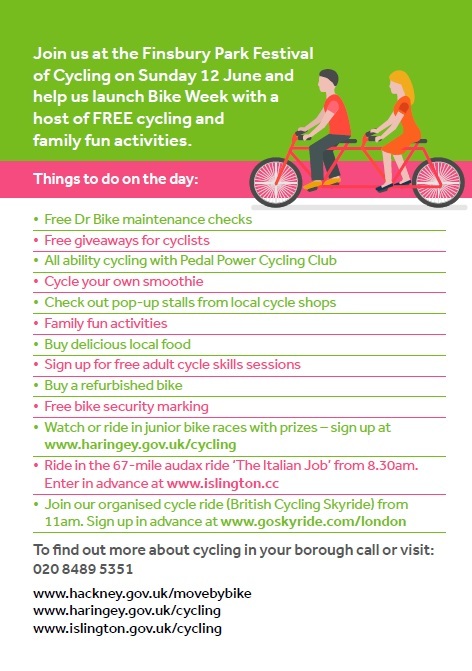 There is a ton of free bike activities, family fun and food on offer. Islington Cycling Club are staging a 100km bike ride that starts and finishes in Finsbury Park. 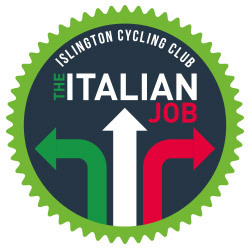 The ride is called The Italian Job and it takes place on 12 June, the same day as the Finsbury Park Festival of Cycling. You’ll go out to Hertfordshire as far as Little Chalfont and be back in time for the festival. It costs £9 and you can enter here. If you’re a beginner (or an improver) and want to practice off-road to learn to ride a bike, you can do a free adult weekend courses. More advanced cyclists wanting to improve their on-road skills can book individual training. To learn how to ride together as a family, you can book a family training session. Explore the borough on our Islington By Bike rides! There are two rides on Friday 1 April setting out at 10am from Rosemary Gardens and Elthorne Park. There’s a rest stop halfway and we will get you back by noon. 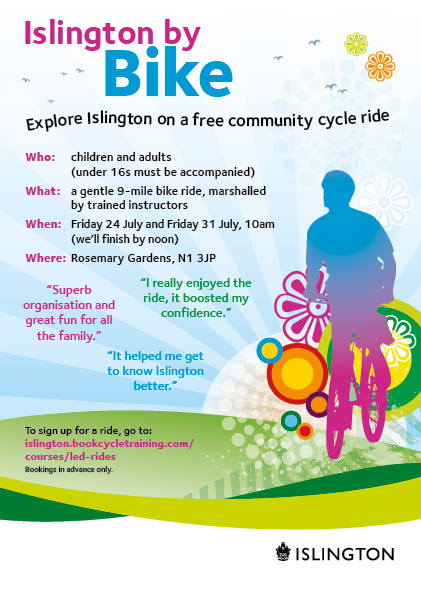 These family-friendly rides are run by Islington Council and led by qualified instructors. Free of charge, but places are limited, so book in advance here. And we’re running them at three venues in N19, N1 and NW3. For full details and to book, click here. If you’re a beginner (or an improver) and want to practice off-road to learn to ride a bike, you can do a free weekend course. More advanced cyclists wanting to improve their on-road skills can book individual training. Explore the borough on our Islington By Bike rides! There are two rides on Friday 19 February setting out at 10am from Rosemary Gardens and Elthorne Park. There’s a rest stop halfway and we will get you back by noon. These family-friendly rides are run by Islington Council and led by qualified instructors. Free of charge, but places are limited, so book in advance here. Sport Islington’s Club of the Year Islington Cycling Club are running two big public entry challenge rides. The Great Escape is 200km from Look Mum No Hands! in Old Street to Essex and back, while The Italian Job is a more modest 100km and takes you out to Little Chalfont from its start point in Finsbury Park. For more details about the club’s regular rides visit the club website. You can do a weekend course if you are a beginner or an improver and want to practice off-road. And advanced cyclists wanting to improve their on-road skills, can book individual training. Explore your borough on our Islington by Bike rides – there will be 12 rides over the next 12 months! These family-friendly community bike rides are suitable for children and adults. They’re run by Islington Council and led by qualified cycle instructors.Free of charge, but places are limited, so you must book in advance here. The first two rides set out at 10am from Rosemary Gardens and Elthorne Park on Friday 30 October, feature a rest stop halfway and will get you back by noon. There are also two Sky Rides in Islington on Sunday 27 September (Islington Local Pride: Canals, Parks and Quietways) and Sunday 26 October (Islington Local Pride:Emirates, Ecology Park and Finsbury Park). Both are 10-mile rides at an easy pace. They’re also free to take part in. Fresh from winning Sport Islington’s Club of the Year award, Islington Cycling Club have grown even more and have now reached 425 members. They run eight weekly rides with local start points. For more details visit the club website or email the club secretary. The photo below is from one of their ladies rides. Our bike maintenance classes have proved so popular that they are currently fully booked. We’ll add more when we can. Meanwhile, we have found out about another free bike repair class and workshop that you might find useful. It is every Wednesday, 5pm-8pm, 1 Rochester Square, NW1 9RZ. Just turn up with your bike in hand. There are also details of further maintenance classes and links to many other local cycling facilities. There has been high demand for our summer holiday Bikeability courses for children. So, much so that there are just a few places left at our regular venues – Elthorne Park, Rosemary Gardens and Haverstock School. So, we have added a whole new week of courses at a new venue…the Emirates! You can see the details and book here. Cycling is a lot of fun and if you just want to go for a big cycle, join us on one of our Islington By Bike rides. These two family-friendly community bike rides are suitable for children and adults who can ride a bike competently. They are run by Islington Council and led by qualified cycle instructors. Free of charge, but you must book in advance here. They set out at 10am from Rosemary Gardens, feature a rest stop halfway and will get you back to Rosemary Gardens by noon. Our bike maintenance classes have proved so popular that they are currently fully booked. We’ll add more when we can. Meanwhile, we have found out about another free bike repair class and workshop that you might find useful. It is every Wednesday, 1 Rochester Square, NW1 9RZ. Just turn up with your bike in hand. The third Finsbury Park Festival of Cycling takes place on Sunday 14 June (12noon-6pm), where there will be loads of free cycle-related things to take part in, as well as food stalls, face painting and a bouncy castle. See the flyer for more details. On Friday 24 July and Friday 31 July we’re running fully marshalled family-friendly bike rides around the borough. They are free to take part in, but you must sign up in advance. Children must be accompanied by an adult. Book here. Here’s a slideshow from a previous ride. We’re running these at venues in N19, N1 and NW3. For full details and to book, click here. You can do a weekend course, if you are a beginner, or for improvers and advanced cyclists wanting to improve their road skills, book individual training. And to learn how to ride together as a family, you can book a family training session. There are also three Sky Rides that start in Islington this summer on Sunday 26 July, Wednesday 30 July and Sunday 27 September. They’re free to take part in. 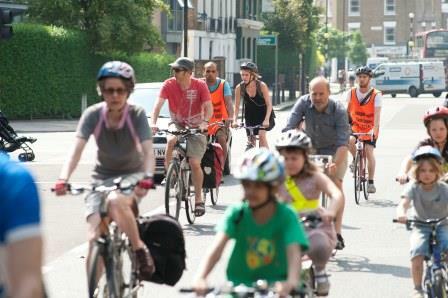 The London FreeCycle is a free family-friendly ride on closed roads in central London on Saturday 1 August. If you want to take part, Islington Cyclists’ Action Group is running a feeder ride from Highbury Fields. Ready for you to book! We have a full programme of free cycling courses running at Easter to get you all set to enjoy the summer in the saddle. The third Finsbury Park Festival of Cycling takes place on Sunday 14 June (12noon-6pm), where there will be loads of free cycle-related things to take part in. Owing to demand, we’ve added a Level 1 Bikeability course to our half term programme and two beginners courses. For details and to book, go click here. There are also adult courses for beginners and improvers on 21 and 22 March. If you’re already riding on the roads and want more skills and confidence, you can book individual training. Happy 2015! We hope you enjoyed a wonderful festive season and are full of plans and resolutions to get cycling in the coming year. We’re running a series of children’s courses in the February half term holiday. There are courses for: beginners (children who can’t ride a bike at all), Bikeability Level 1 (off road control skills) and Bikeability Level 2 (an introduction to road cycling). There are three venues to choose from and you can book here. Our popular series of adult group courses for beginners and improvers continues with more courses available in January and February. 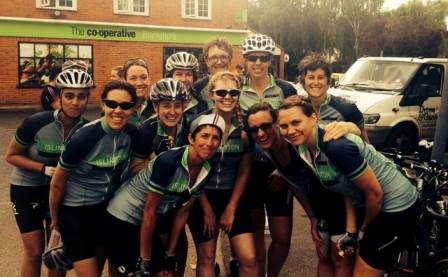 If you’re looking for a really big cycling challenge to motivate you in 2015, our local cycling club, Islington CC, is running a 200km ride on 17 May. The ride is called The Great Escape and it starts and finishes in Islington, from the bicycle cafe, Look Mum No Hands!, in Old Street and takes in lots of lovely leafy lanes and villages in Essex. It costs £10 or less to enter. If 200km seems like way too much, British Cycling will be running their excellent series of free Sky Rides. These rides are set up for you to ride at a comfortable pace and a distance to suit you. Choose from: Sky Rides (traffic free mass rides), Sky Ride Local (led rides), Breeze Bike Rides (women’s rides) and Ride Social (social riding groups). This year the Sky Ride Local rides will include some Islington based rides.